A recent report by the NEA revealed that almost half of all Americans fail to read a single book each year. This shocking statistic underscores the importance of encouraging our children to read. 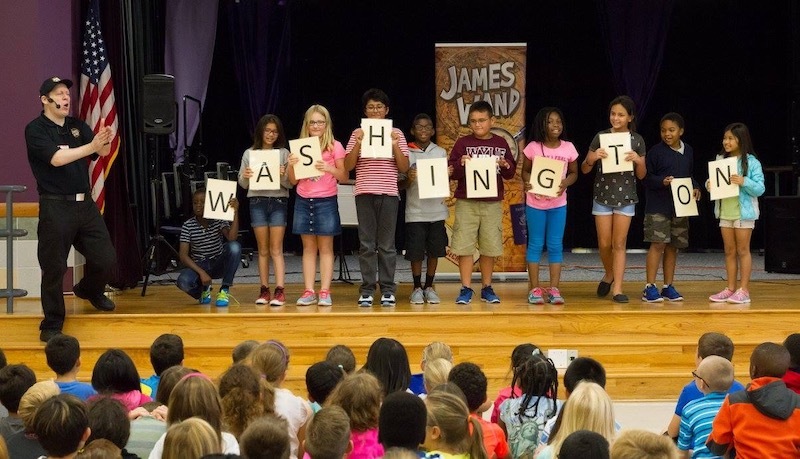 The James Wand Secret Agent Magic Show is a fantastic way to motivate your students to WANT to read more. By incorporating books and reading into an exciting story of secret agents and international adventure, James Wand gets kids racing to the library! While the students are having fun, teachers are also happy to find plenty of educational content packed into the show, including anagrams, library etiquette, book categories, the Dewey Decimal system, word etymology, homonyms and synonyms. The children even learn to say a word in four different languages! James Wand’s easy-to-arrange program is designed for elementary school-aged children. The show is 45 minutes of fantastic educational entertainment for grades Pre-K through 6th grade.